A curve ball flew by two weeks ago and hit me square in the face. The Pop/Rock/musical heritage of the north-east is pretty easy to sum-up, Ferry, Knopfler brothers, Sting. The Animals, Prefab Sprout, Lindisfarne and of course Jimi Hendrix (this last one is not entirely true, but he did live on Tyneside for a while). Then a couple of weeks ago a friend asked me if I had ever heard of this band, who have been around since 1980, Zoviet France, from Newcastle. What!!! from Newcastle Tyne and Wear, or some other Newcastle in an alternate universe. I managed to find the album Mohnomishe and it is getting a first spin tonight. This is very interesting stuff and in many ways is light years ahead of its time, a kind of Cabaret Voltaire for the unhinged, I like it. I am trying to construct some bad jokes around Tyneside accents and ambient music, but it just ain’t happening. Micro review; A Geordie Aphex Twin. An Aside; I am still puzzled by how they seem to have completely passed me by. 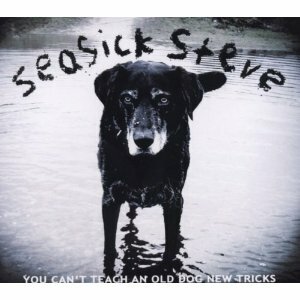 Currently my third favourite Seasick Steve album, but that is ever changing. Here is my key to getting into and liking Steve. Either go and see him live, which is the preferred option, failing that put this album on very loud, when you are preferably alone, and dance around the house doing 3 string air guitar. I guarantee, from experience, that both options will work. I just love the track Don’t Know Why She Love Me But She Do, sometimes the adage, less is more, really does make sense, who needs a full drum kit anyway. I think it is odd that Seasick Steve is so popular, a 72 year old guy playing home-made instruments. In the land of Britain’s Got X-factor, his popularity gives me hope.